Yarn and Fiber Happenings: Jump on the Noro Train and Save All Weekend at the Yarn and Fiber Company March Madness Sale - Toot Toot! Jump on the Noro Train and Save All Weekend at the Yarn and Fiber Company March Madness Sale - Toot Toot! Sale spans the Weekend and Starts Early - Prices in Effect Now! Prices on website reflect the sale prices - there are no further deductions when you check out. Noro Blossom Yarn - very, very limited amounts... this is a discontinued yarn that is beautiful! 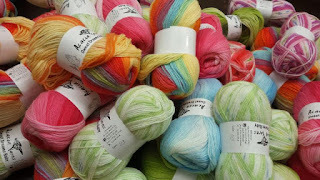 Noro Kochoran Yarn - We have lots of discontinued colorways as well as the newest colors. Noro Lily Yarn - very, very limited amounts... this is a discontinued yarn that is beautiful! Noro Transitions - very, very limited amounts... this is a discontinued yarn that is beautiful!